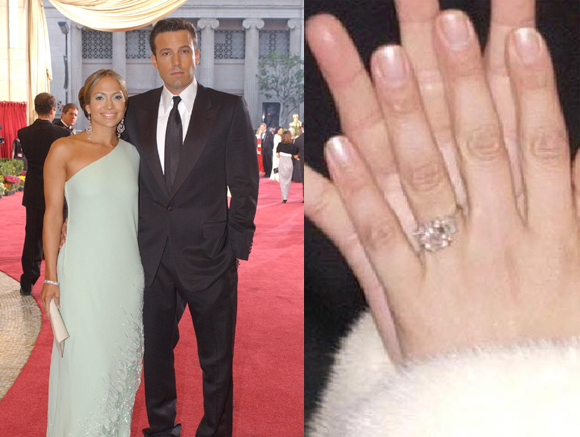 Celebrity Beauty: Jennifer Lopez: Looking Back On 5 Engagement Rings & The Men Who Picked Them! Don’t be fooled by the rocks that she got — learn from the dating history of Jenny from the Block! 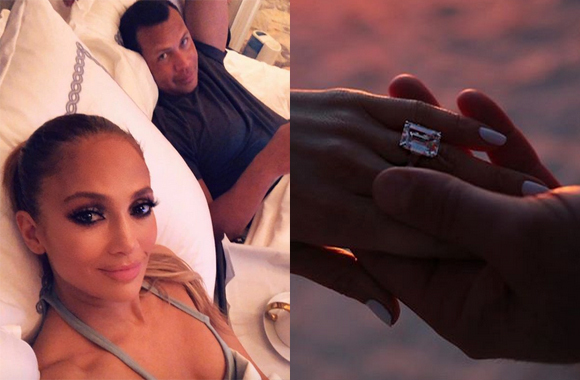 Jennifer Lopez finally got engaged to Alex Rodriguez over the weekend, and it made us super excited for their future. But also… it got us thinking about J.Lo’s past. Related: Are J.Lo And A-Rod ‘Soulmates’? The Maid In Manhattan star’s relationship history has been rocky in more than one way — she’s worn FIVE engagement rings in her life! As lovers of all things shiny and fashionable, we simply had to compare and contrast the jewels themselves. And as obsessive fans of celebrity love lives, we had to think about what the rings meant for Jenny at the time — and what they said about the men who gave them. In February 1997, Jennifer married a Cuban waiter named Ojani Noa. Not much is known about him or their relationship, and that’s by design — but put a pin in that for now. Let’s talk about the ring. It’s even hard to find surviving pics of the precious! Is it possible Jen paid for the ring herself? After all, her star was already rising; she couldn’t be seen with some scrub ring, right? To be clear, J.Lo was nowhere close to an A-lister yet, but was well past her backup dancer days. She’d just had a starring role in the 1995 Wesley Snipes/Woody Harrelson thriller Money Train and a supporting role in the Robin Williams dramedy Jack. With more films in the can, she may have had the funds to get her own diamond. Ironically, it was the relationship which went pear-shaped shortly after the wedding. The couple were married in February of 1997. In March, Selena hit. And it hit hard. A tragic biopic in which the lead had to evoke a superstar singer? Total starmaking performance. Immediately the name Jennifer Lopez was on everyone’s It Girl shortlist. Suddenly Jen was someone who could carry a movie. She was a draw. She was a star. It was a huge shift that happened very fast, and it’s no surprise it threw her VERY recent marriage into turmoil. Again, details are sketchy but we know they were divorced by January 1998. The marriage didn’t even last a year. Years later Noa tried to write a memoir about the experience, and she sued him. Apparently they signed a confidentiality agreement which prevented him from “casting her in a negative light.” Damn. As for what happened to the ring? We have no idea. In 2001, Jen moved on with and married rebound Cris Judd — no, not a rebound of Noa — he was well in the rear view by this point. No, Cris was a rebound of her relationship with Diddy. Y’all didn’t forget this one, right? With Jen wearing that dress you’d be forgiven for missing the fact there was a famous rapper standing next to her! LOLz! Yep, J.Lo’s real rebound from her ex-husband was a music career. She dropped her first single, If You Had My Love, in May 1999, and it immediately became a number one on Billboard. She was going to have it all — a movie career AND a pop career. She was going to succeed where so many had failed… and fail where so many had succeeded. It was around this time she started dating Sean “Puffy” Combs as he was known at the time. They were together for several months and seemed incredibly happy. Unfortunately they split up in 2001. While her career was skyrocketing, her personal life was careening out of control. Enter the safe, strong hands of supporting dancer Cris Judd. The two began dating in 2001 and got engaged — and married — almost immediately. The ring was an emerald-cut diamond. Square. Safe. Not like her relationship with Diddy, which involved weapons charges and cheating. Also, again the ring was estimated to be in the SIX FIGURE range. How much do backup dancers make again?? This relationship, too didn’t last. They were only married from September 2001 to June 2002. Nine months. There’s a more obvious reason for this breakup though. Right after Cris began the reign of Bennifer. Well, Bennifer 1.0 but they didn’t call it that then. LOLz! Now, this ring — this is something really beautiful. It’s a Harry Winston 6.1 carat pink diamond solitaire, and the photo does not do justice to it. The color, the cut, it’s all pure elegance. We also can buy that movie star Ben Affleck was able to afford what this ring was estimated to cost at the time — $1.2 to 2.5 MILLION! And it’s likely only increased in value since. Jen and Ben met on the set of the 2002 film Gigli. It was a crime comedy from the director of classic hits Beverly Hills Cop and Midnight Run. It starred two incredibly hot young stars with IRL chemistry. And it. Was. Terrible. Somehow despite having everything going for it, this film just ended up a critically panned box office disaster. A trainwreck. On paper Ben and Jen had everything — including paper. They were rich, beautiful, they were in movies and music videos together. Remember how Jenny From The Block was just one long commercial for how glamorous their lives were? But having everything wasn’t enough. At least not for Ben. He wanted a different Jennifer. The hopeless feeling lasted, according to Jen, a whole three days before a friend came along to save her. Jen had been friends for years with Marc Anthony, but it was only after her devastation at the hands of Affleck that he swept her off her feet. The singer-songwriter seemed like the perfect fit. He too was an entertainer, he had just been through a divorce. But don’t call it a rebound; they lasted longer than their previous relationships put together! That beauty is a Harry Winston 8.5 carat blue diamond, estimated to cost about $4 million! Wow! That really is something which will last quite a while and grow in value. Not unlike J.Lo and Marc, who kept it together seven years, which for them was a milestone. More importantly they’ve stayed civil as they’ve been coparenting their twins, Max and Emme. After Jen and Marc’s split in 2011, she once again retreated to the muscular arms of a backup dancer. This time, however, she did not buy an engagement ring for herself “from” him. She did, however, date Casper Smart of and on for almost FIVE YEARS. Wow. But it wasn’t until 2017 she really fell hard again. That brings us to the present and to Alex Rodriguez. And boy do they make sense as a couple. They’re both huge successes, wildly rich, super athletic. But they’re also both from humble beginnings. They’re single parents who prioritize family. J.Lo and A-Rod. Even their names are perfect for one another! And the ring? Well, let’s just say it may not be the fanciest, but it is the most solid. As in, it’s a HUGE HUNK OF STONE! Yeah, that is a 15-carat diamond, worth somewhere between $1 to 5 million. Yowza. Again, it’s emerald cut, just the one stone, nothing too fancy — but there is just so much there. And you could absolutely say that about their relationship! 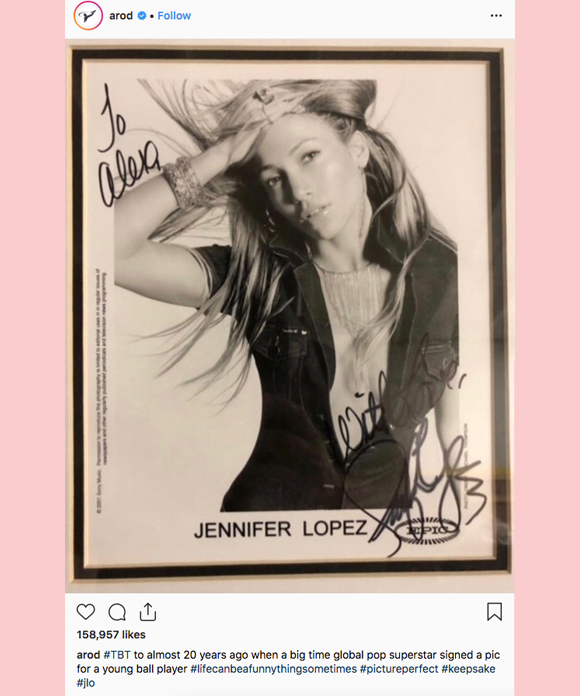 Heck, A-Rod even proved a couple months ago just how long he’s been committed to J.Lo by showing he’s kept an autograph she gave him 20 freakin’ years ago! The other thing that really works about their relationship? Unlike the constant hounding by the paps and tabloids with Ben Affleck, this has been happening in the age of social media. Jen has been able to control the information she chooses to give out about the relationship, which has led to MORE insight. We’ve seen the couple’s workout routines, date nights, diets, family movie nights; it’s all been so open! We hope without the added pressure of press, these two mature adults can stand the test of time. Lord knows that huge rock will.